Sr Wrays Perez Ramirez, Indigenous leader of the Wampis or Shuar people of the South American Amazon, has held the position of PAMUK or President of the Territorial Autonomous Government of the Wampis Nation since November 2015. His academic preparation included study at the Institute of International and European Studies “Francisco de Victoria” of the Carlos III University of Madrid, Spain, where he was granted the title of “University Expert in Indigenous Peoples, Human Rights, Governance and International Cooperation“. Wrays’ long history of leadership began at the age of 24 in his own Shuar community in the Amazon, where he worked to defend the collective rights of Peoples and Communities. 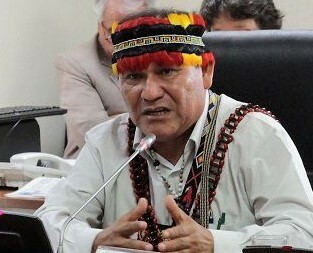 He has held various positions of regional importance in the Amazon basin of Peru, serving as Regidor of the District Municipality of Río Santiago from 1987 to 1989; President of the Aguaruna and Huambisa Council between 1991 and 1996; National Secretary of the Association of Indigenous Peoples of the Peruvian Amazon (AIDESEP) from 1997 to 2002; President of the Special Commission for the Supervision of Institutional Management of the Regional Government of Amazonas in 2003 and 2006; Regional Councilor of Amazonas for the Province of Condorcanqui from 2003 to 2006; and President of the Commission of Environment and Environmental Management of the Regional Government of Amazonas in 2004 and 2005. His experience is recognized in the international arena as well: he has held the Indigenous Chair of the Intercultural Indigenous University of Latin America and the Caribbean, and has been a member of the Bi-national Technical Team for Development and Border Integration between Peru and Ecuador. With the backing of the Council of Wise Men, the Autonomous Territorial Government of the Wampis Nation upholds the tenacious defense of its ancestral territory — including its rivers, which have been damaged, and remain under assault, by illegal mining. Under the leadership of Wrays Perez Ramirez in his role as Pamuk, the Wampis joined the TICCA Consortium in 2017.